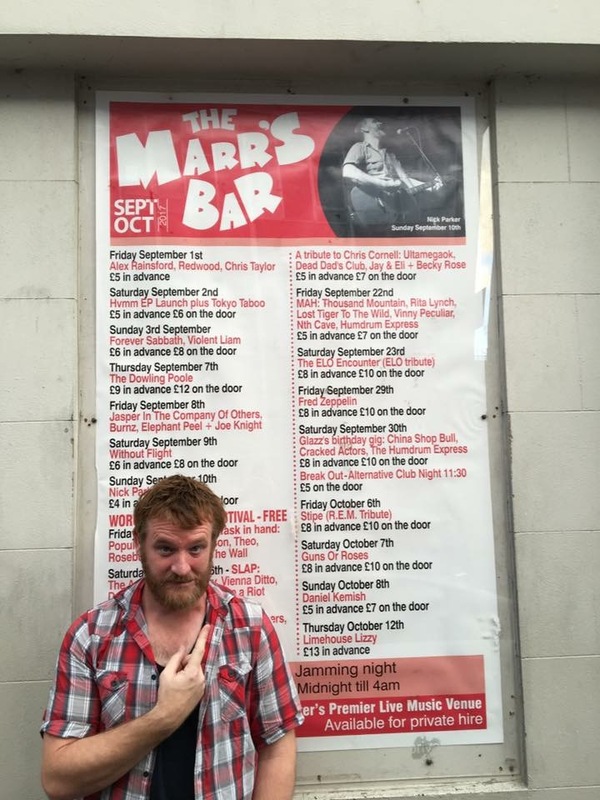 Then it was on to the venue – The Marr’s Barr looks pretty nondescript from the outside, little more than a doorway on a terraced street, but inside a lovely intimate space reveals itself. A bar to the right, to the left the stage and tables with candles make a lovely up close and personal gig space. Nick’s added stickers to his merch range so I grabbed one to adorn my cajón, must remember to get it stuck it on there before it gets mangled in my wallet! First up was Wes Dance, a local performer who I’ve not seen before – he took to the stage armed with his guitar. A melodic mixture of strumming and finger picking with a soulful voice, I really enjoyed his performance whilst the room started to fill up. I think the first track was called Tristessa, then onto Silver Horse. 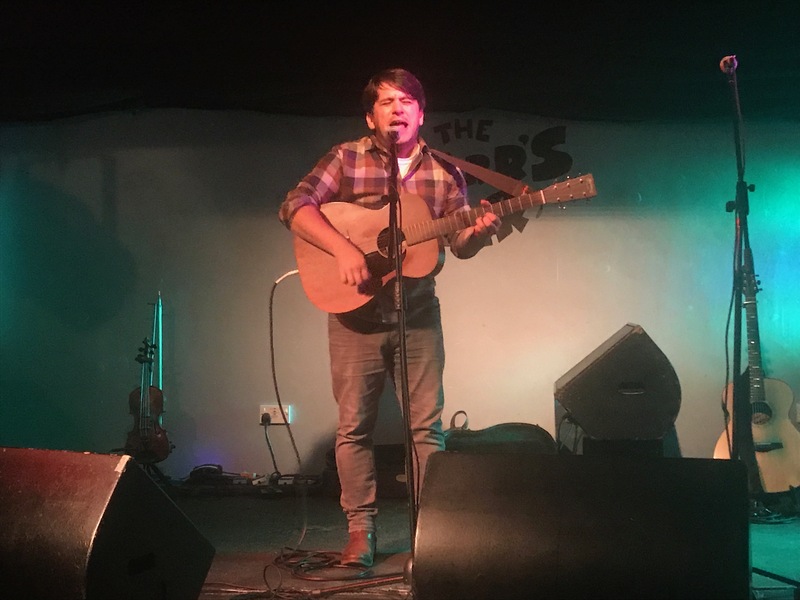 A group of people emerge into the venue quite noisily, then start shushing each other as they realise the gig has started – Wes joins in the shushing, it was probably a ‘you had to be there’ moment but it tickled me. His songs are full of thought provoking lyrics – I’m going to make an effort to have a proper listen without the distraction of being in a venue, soulful laments with real feeling. Harder Road to Come was up next and then The Brothers, then a cover of Jonathan Richman’s When Harpo Played his Harp. Then more original material, If Time Flows Like a River and Henry Miller, about the author who lived largely in poverty until some nuances of the publishing industry were resolved allowing him to reap the rewards of his work. See – thought provoking! I’m not 100% sure on the title of the next song, I’m going to take a stab at Paper Helmet from just listening to it, and soon enough the set was winding to a close with Fiesta. This was another interesting song, from the point of view of a prisoner who was generally happy with that state of affairs, until the one day a year the fiesta was on where his perspective changed. Definitely worth checking out Wes’s stuff on his Soundcloud Page. 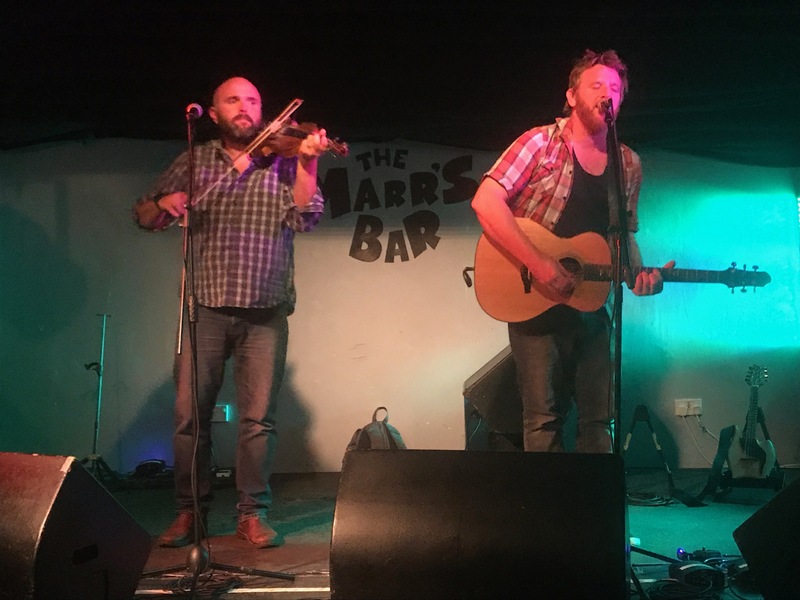 Then it was time for Nick Parker and Ben Wain to take the stage – Nick immediately kicking off his shoes, revealing later he was wearing Harry Potter socks (which Ella would approve of!). The story behind this being that he’d done something similar at a gig where the carpetted stage was actually soaking and an embarrassed proprieter had nipped out to buy him some socks to replace his sodden ones – and these were they. Not that there’s anything wrong with wearing Harry Potter socks of course, unless they are ones with Dobby on them. Anyway, I digress. 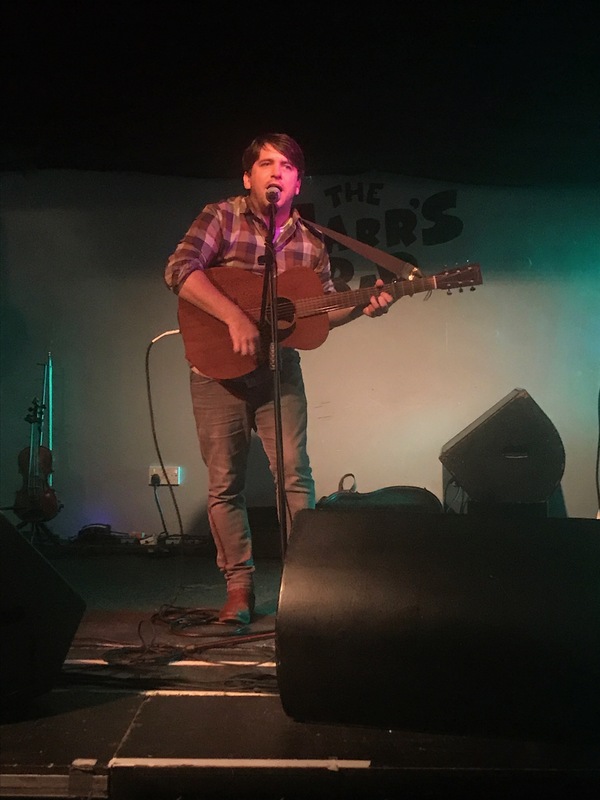 The set started off with Departures – Ben added in the ‘ba ba, ba-da ba, ba ba’ bit with his fiddle, although the crowd kicked into join him pretty quickly. What looked like a stage invasion turned out to be Dave, one of the double-denim protagonists, ready to perform a kazoo solo. It was pretty funny, Nick quickly quipped to Ben that they were obviously in the wrong key – arf. 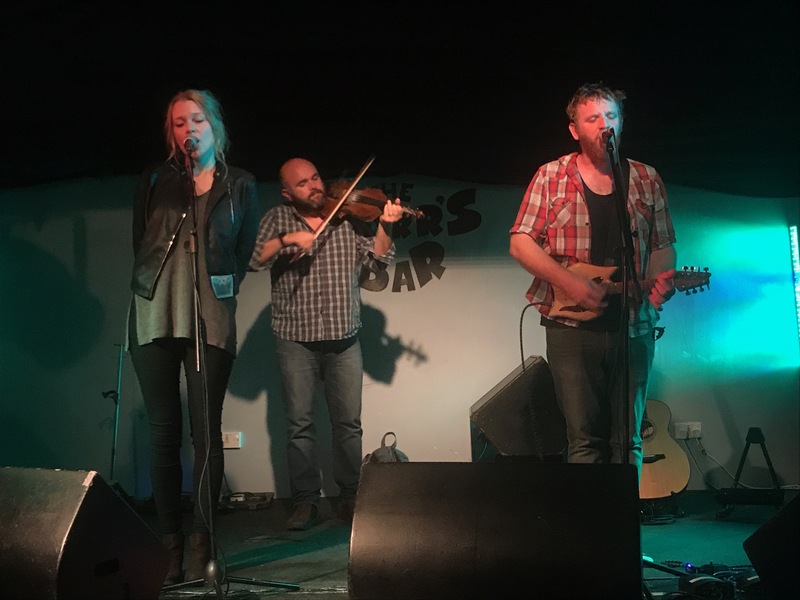 I’ve Never Been to Dublin Before was up next – Ben adding backing vocals as well as fiddle to great effect. Make Yourself at Home was up next along with the back story of the gig in Frome which inspired it – and then Could We At Least Try which I’ve not heard live for a while, so that was a treat – the audience harmonising at the end sounded really nice, although I can say that in the safety of not being able to hear myself! At this point Nick made the amusing revelation that Ben looks a bit like the singing man from the 1980’s Cornetto advert, I have a similar vague memory but searching YouTube for old videos has yet to yield any meaningful evidence! An Open Letter to my Human was pre-fixed with the story of Kenny the dog, who wrote the song of course, had done a runner just as Nick was due to leave for the gig making him late. Emily Larkin was invited on stage next for A Simple Song which sounded great, Nick changed the lyrics slightly to ‘I’ll get the wolf from the door with this old violin’ to cue Ben in for the instrumental. There was a reminder for the attendees to check out the lyric video he made (and apparently caused his ongoing bad back, according to Ben), so I’ll remind you too – watch it here. A rare cover – You Couldn’t Have Come at a Better Time, familiar to me from Mad Dog Mcrea having it in their roster of songs, but probably more widely known as Luka Bloom’s (younger brother of Christie Moore) song. It sounds ace though, Nick once (years ago) dedicated it to a friend who’d just had a baby, blissfully innocent to the spectacular aptness of the dedication. It finished up with a foot-tappy fiddle driven jig (or is it a reel? I still haven’t distinguised between them!). Come On! Jump Over Your Shadow is one of my favourite live songs – but I appreciate it probably takes a reasonably intimate setting (and well behaved crowd) to carry it off, being gentler and melodic. Nick had encouraged the crowd to call each other and then utilise the feedback to create what sound like birdy sounds, particularly during the whistling section. Next up was Jerusalem, which Nick was reluctant to play but Ben wanted to – for the record, I think it works very well in acoustic guise! Emily was back on stage next to duet for I Guess I’ll Never Know, which is a lovely song – there’s a video coming out for it soon which sounds really exciting. After a quick hands-up exercise to see how many people hadn’t seen Nick before (there weren’t many, but there were a few!) 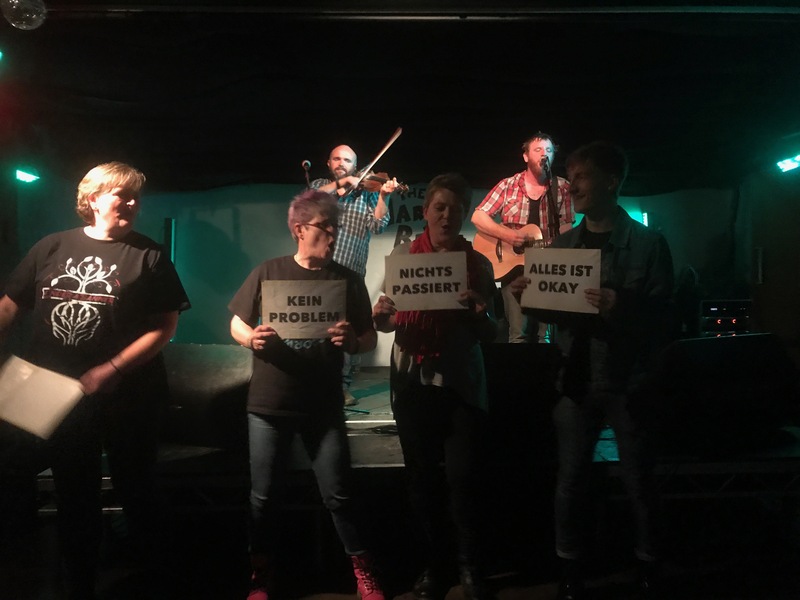 it was deemed volunteers were needed for placard holding for Es Tut Mir Leid – we were even treated to a bit of a dance routine too (a spontaneous one as well as an announced one at Nick’s bidding – fun as ever! Terry and June was, as ever, a real crowd pleaser – it was an ‘in off the pink’ kind of evening, and then the set was winding to a close with Metaphor – Nick invited the audience to join in with the chorus which is in French, which amused me (you’ll have to listen to the song to get the joke!). There were loud and insistent calls for an encore, Dave volunteered his services for a kazoo solo which was eventually accepted – although Not Fooling Me was probably not the vehicle for it, Dave agreed eventually casting the unused instrument onto the stage to an eruption of laughter. Before the last song Nick was talking about being mistaken in type for Nick Harper – and actually being mistaken for him in person by someone who’d seen them performing in back to back sets, and Ben had once been mistaken for a beatboxer (presumably not Funke!). The final song was Ice Ice Baby – it was fun watching the crowd gradually realise what he was singing as it starts out slow then builds into the proper tempo, ending with the slackening of the low E string on his guitar to give a bass drop, and render it unplayable without tinkering and thus ended the set! It was an ace night – I was tired and eager to get off so made a very quick round of goodbyes to people I could immediately see and hit the road, needing to find some fuel en route. An awesome evening’s entertainment, and despite his protestations Nick totally justifies his ‘headline’ billing.